ADANI protesters were left "shaking" after a confrontation with a Bowen local who accused them of "holding up normal people" in a profanity-laden exchange that has gone viral. The incident is a stark example of the simmering anger between North Queensland locals and the mostly southern anti-coal protesters from the Stop Adani movement who have caused chaos on the transport network. The protesters have also shut down the region's major export hub twice in the past week, costing the economy millions of dollars. 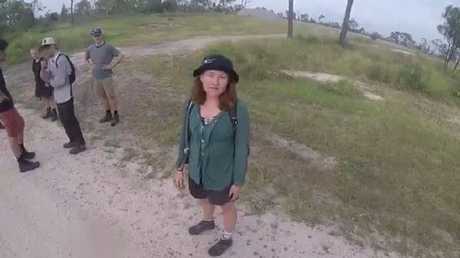 In the heated exchange captured on an action camera, the Bowen local spoke to the anti-Adani protesters and asked them if they were "staking out houses". A member of the activist group explained they were in the area to stop an Aurizon train. The Bowen man warned the activists not to block the road, saying he had children and he may need to get them out. An Adani activist speaks with the Bowen local in an exchange which left the protester “shaken” but was widely supported on social media. "F----g o not come near our f----g place or f----g stop this. I don't f-----g care what you do with the train lines you f-----g idiots. "Don't involve normal f----g people you f----g idiots. The profanity-laden video then showed the man approach the activists where he exclaimed "Look at you you're shaking you f----g p---ies." "You're holding up normal people," he said. Clearly frustrated, the man said "Look at ya'. "Look at ya'. You've haven't got a decent f----g (expletive) between yas'." "If people wanted to get real you f-----g (expletive) would get f----g hurt." He then drove his motorbike towards a waiting car with an activist inside who was filming the exchange. "I can film you too you f----g idiot," he said. "I've got nothing to do with the train lines I'm just sick of f---g idiots around here." The man then drove to a nearby Aurizon vehicle with two staff inside where he said, "I'll take all these weak (expletive) out if you want aye'." "I will, look at the f----g weak (expletive)"
"If youse (sic) like trouble I'll give youse (sic) f----g trouble. "F--k off somewhere else. Are you for real? Look at youse (sic). "People have enough dramas without you... being around their house causing s--t."